Every year, millions of school children, teachers, families and offices get involved in Save the Children’s Christmas Jumper Day, donning their daftest knitwear to raise money for one of the UK’s most beloved children’s charities. It only took a stroll down the street on Friday 16 December 2016 to notice how much this very silly day had grabbed people’s attention – jumpers were everywhere! Since 2014 Small Axe has been part of the Christmassy fun, and in 2016 we developed a digital supporter mobilisation strategy that would up the ante again. We created and delivered a comprehensive email journey that helped to inspire more than five million sign-ups and raise over £3 million. We also illustrated and developed a package of iOS stickers that were downloaded hundreds of times from the Apple App store in the run-up to Christmas Jumper Day. It may come as a surprise that the first Christmas Jumper Day email is delivered in July; a full six months before the day itself. For teachers – an important target audience for the campaign –planning is key, so letting them know about Christmas Jumper Day early is essential. Of course, that also means designing a full six-month supporter journey that can keep participants engaged, excited and informed before the big day. Early in 2016, we met with Save the Children’s Christmas Jumper Day team to optimise journeys for each of the key segments. Together, we mapped out the core content ideas that would inform the campaign, added in assets, tone of voice guidelines and thematic elements that were developed by Save the Children (in 2016 the theme was ‘Silly just got Serious’). In July, we designed and built a series of email templates targeted at several key demographics, then began work copywriting dozens of marketing and stewardship emails. Some of the emails, like those addressed from a teacher or office worker, would be ‘kickers’ inspired by forwarded emails – copies of a previous email with a personal message above. These proved particularly successful, as were emails which added value to recipients – messages like a late December email to schoolteachers with the subject line “Your Christmas Jumper Day checklist.” This achieved the highest open rate of the campaign. In the run-up to the big day, we piloted a set of iOS stickers for iPhone – designed to increase reach and engagement ahead of the event. We also advised on use of TINT, an embeddable social media aggregator on the Christmas Jumper Day website, drawing in a stream of user-generated content with curated hashtags in order to create an exciting live gallery of photos, posts and tweets. When Friday 16 December 2016 finally approached, this was a buzzing hive of activity, with thousands of participants sporting their knitwear and using the #ChristmasJumperDay hashtag. The result? More than 5 million people were signed up to Christmas Jumper Day 2016, and a grand total of £3.7 million was raised to help save children’s lives around the world. A follow-up survey confirmed that 92.8% of participants thought that levels of communication were ‘about right’, while a fantastic 98.78% said they would take part in Christmas Jumper Day again. We followed-up the journey with a small series of stewardship emails in January and February, completing the important challenge of encouraging sign-ups to successfully pay in their donations to Save the Children. 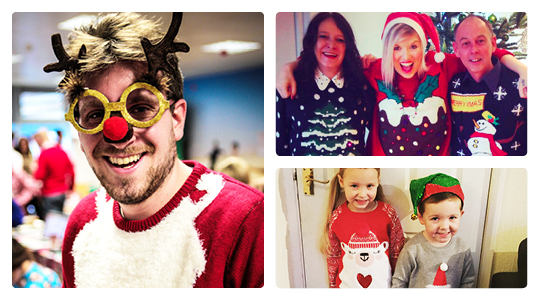 Our email journeys and iOS stickers formed part of an exciting multi-channel campaign, both online and offline, that made Save the Children’s Christmas Jumper Day a huge success in 2016. Through our use of copy, design, development and creative we helped make Christmas Jumper Day bigger and better than ever before, and we look forward to applying our expertise to plenty more impactful and memorable campaigns in the future (the more Christmas puns the better). Hollie Pycroft is a campaigns manager at Small Axe. A team of creatives, developers, writers and organisers, at Small Axe we move people to act on the most pressing issues of our time.